Howard is a native of the mountains of eastern Kentucky. His mother spawned his love for music by introducing him to the guitar at age five. While the love of music never did leave him, his career pushed him in a different direction. While building his business, he traveled to the Florida Keys, where he developed a severe case of “Keys Fever” He never wanted to leave. The more he visited, the more music, and the keys called out to him. Finally, he surrendered. The islands called both he and his guitar. He teamed upo with this group of talented musicians and Mile Marker 24 was born and the island music goes on and on. Since I started playing guitar at age 12, I have always wanted to be a professional musician. After joining Mile Marker 24 in October 2005 I began travelling back and forth from Indiana to the Keys. I fell in love with the Keys and the whole lifestyle. Needless to say I finally traded in my snow angels for sand castles and my wife, Jamie, and I moved on down. After saying goodbye to the cold winters of Minnesota, my wife, Barb, and I bought a sailboat and cruised the coasts of Florida. I played steel drums in many of the tiki bars along the way, 'til we reached the end of the road in Key West. We thought we'd stay for a few months and that was nearly eight years ago! During those eight years I headed north during the summers to the Lakes Area of Minnesota where I played steel drums with the band "Island Time". 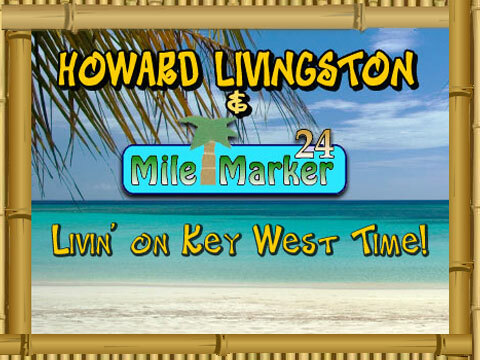 That all changed when I first heard "Howard Livingston & the Mile Marker 24 band" in the Florida Keys. I realized that playing and touring with Mile Marker 24 would be a dream come true. Now, as a member of the "Mile Marker 24 Band", I'm looking forward to playing the best venues in the Florida Keys and hitting some of the hot spots in our northern summer tours! Hope to catch you along the way! !